This is one of the several picture books in the artist focused series by publisher Laurence King Publishing. There are also Warhol and Dali. After reading This is Dali, I moved on to this about Pollock. This book is also authored by Catherine Ingram, and the illustrator is Peter Arkle. The illustrator is different from the Dali book but the style is similar. I like this book. The story about bad boy artist Jackson Pollock is really interesting. It looks at the rise and fall of the famous abstract painter. There's something tragic about the story which makes it more captivating. The accompanying illustrations are nice. There are also selected early pieces of works from Pollock, so for those unfamiliar with his work can see how the works have evolved. 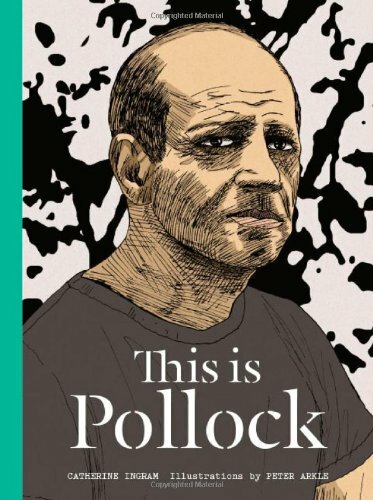 The book's a enjoyable read, a good introduction and less serious biography sort of to Jackson Pollock without much of the boring art talk.